DROID Incredible Finally Receiving Gingerbread Update Right Now? I’m as confused as you are by that title. 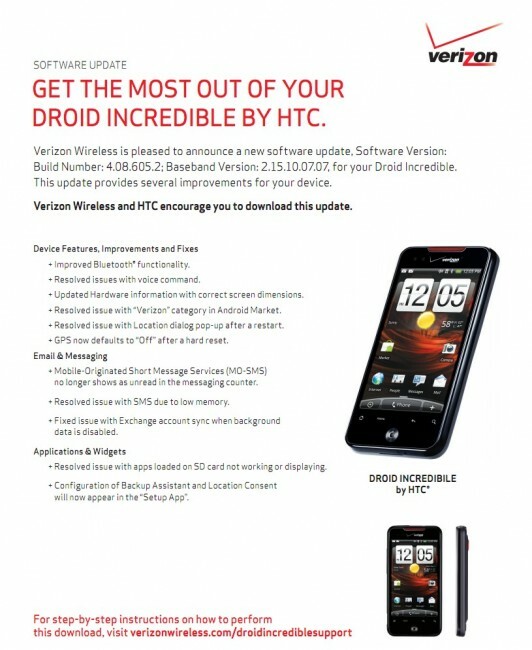 The DROID Incredible was supposed to receive Gingerbread (Android 2.3) back in September, but as non-rooted owners of the device know, that sort of happened yet didn’t at the same time. It vanished as quickly as it was available, only to never be mentioned of by HTC again. And then just moments ago, one of our readers was prompted to receive a new update with build number 4.08.605.2 which differs from that of the original Android 2.3 build. The odd thing you will notice here, is that Verizon is claiming this update to be just 8.6MB, but how could that be if some of the people scheduled to receive this are still running 2.2? Wouldn’t this update need to be of epic proportions? Confusion at its finest. To those of you still running a stock non-rooted Incredible, please check for a software update now. And if you are on 2.2 or 2.3, let us know which so that we can straighten this out.